Dr. Hovind taught science for 15 years. Then he got his PhD in education. He's always had a love for teaching. But one thing that he has discovered is that in many of the science textbooks across America today there are some fallacies; some false information being presented. Why is this information in the science textbooks? What are they trying to prove? Hi, my name is Eric. And in this seminar called: Lies in the Textbooks, you are gonna to find out some of those lies that are being presented, and what you can do about it. Propaganda for evolution; Education or indoctrination? - Trilobites as evidence that rock layers are 500/600 million years old or are trilobites alive today? Are the mutations the reason for having variation? Is ‘natural selection’ the cause for evolution? - A justification for abortion? - Abortion and ‘free choice’; Abortion áfter birth? Too complex to have evolved? From no-eye to eye... how did that happen? - The eye, a poor design? - Have you seen the watchmaker? Producing life in the laboratory? - Is spontaneous generation of life possible? - How closely related are man and apes? 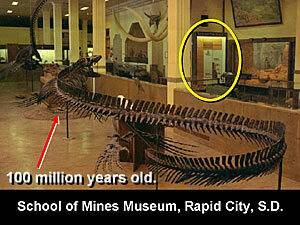 - Where is the fossil record? - Where are the missing links and how do you prove it? - Archeoraptor and Archeopterix, the missing links! - Why would they teach these lies? - Why do they believe this stuff? What do we do about it? What can we do about it? Well, welcome to our seminar on Lies in the Textbooks. My name is Kent Hovind. I taught high school science for 15 years. And now, since 1989, I've been doing seminars on creation, evolution, and dinosaurs. And our goal is to strengthen your faith in God's Word. Now, this is not my wife, that's just a picture of her. We live in Pensacola, Florida. Been there for 16 years. We have three children, one of each, and I got them all married and the dog died. I praised God, so I am home free. And as we mentioned earlier we have four grandkids so far, and that's God's reward for not killing your own kids, when you thought about it. So, we got a whole tribe, and they all live right around me and all work in our ministry. A real blessing to have them right there. 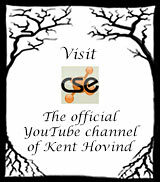 God has given us an amazing staff of people at Creation Science Evangelism (CSE). Our purpose is to get people saved, ok. We like science at our place. We have ‘Dinosaur Adventure Land’. We have a science center, a theme park, and a museum, all kinds of cool science stuff. Some people try to say: “Well, you Christians are against science.” No-no-no, I like science. I am against evolution because it is not part of science. Evolution is a lie, ok. There is no scientific evidence to back up evolution. We will get into that in just a minute. Now, I like science and I collect public school textbooks; I have hundreds of them. From many many countries. From clear back from 1880, I believe, to 2005 textbooks. I am not against science. We happen to really like the subject. We have all kinds of cool science displays at our museum, in our science entry. 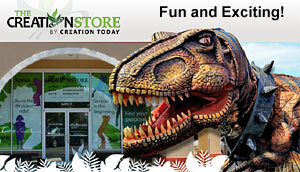 You can come down visit ‘Dinosaur Adventure Land’ and see for yourself. I am however against lying to kids. Now in the first three video's we talked about how students are being lied to about the big bang, it didn't happen. 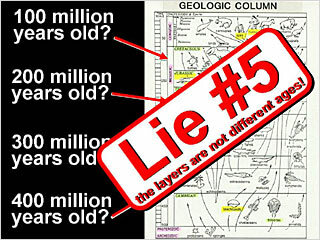 They're being lied to about the age of the earth. it is not billions of years old. They're being lied to about the cavemen. There has never been a ‘cave man’. Unless you mean, Osama bin Laden. 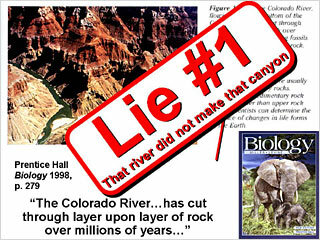 They're being lied to about the dinosaurs. They did not live millions of years ago. Here we're gonna cover about 30 more lies in the textbooks. There are hundreds we could go through. We are gonna try to hit the highlights. This could go for days, just covering lies in our textbooks. I am gonna hit some of the big ones. Leave some of the little ones go for another time, when we have more time. 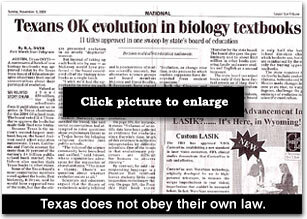 Now, I am not trying to get evolution out of the public schools, I'm not. I think that any theory should be allowed to be taught, if you don't have to lie to support your theory. That's false evidence, ok. I'm not trying to get creation into the schools. And I think Christians that work on either of those are wasting their time. And many people have wasted hundreds of thousands of dollars trying to accomplish those two goals. It's futile, it's not gonna happen. I am however trying to get lies out of the textbooks. 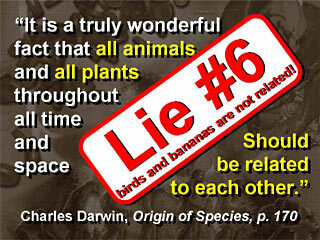 I think we'll find that if we take the lies out of the books there is nothing left to support evolution. Well, that is their problem. They shouldn't have picked such a dumb theory to begin with, ok. It's not my fault, ok.
Now, I am not against teachers. My mother was a godly woman, led my dad to the Lord on their first date. She retired from teaching public school years ago. Been in heaven now for about 7 years. My brother led me to the Lord. He just retired last year from teaching public school after 34 years. There are many good, godly teachers in the system. 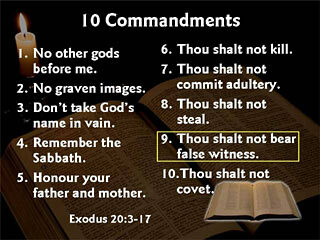 There are many good, godly principles. Many good, godly school board members. I am not against schools. I am not against school boards. I am not against teachers. I am not against textbooks. I am against lies. He, let's just keep it in perspective. Is there anyone here who thinks teachers or textbooks should be allowed to deliberately lie to students for any reason? And I mean deliberately. They might be lying and not know they are lying, ok. But if they are deliberately lying, that shouldn't be allowed, should it, ok? Wisconsin has a law that requires textbooks to be accurate. So does Alabama. “Textbooks shall be adequate and current...,” up-to-date, ok, the latest information. Texas has a law that says: “Instructional materials shall be factual...” Go Texas, ok. Florida has a law that requires “accuracy of instructional materials,” and “The commissioner is responsible to remove books that are not accurate.” Well, commissioner, do your job, ok. Watch this video and remove the books that are not accurate. 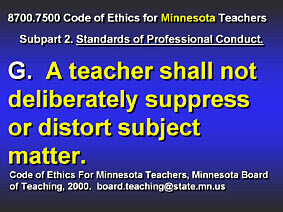 It's simple, so simple, ok. California says textbooks shall be “factually accurate and reflect current and confirmed research,” ok. Minnesota says that, “The teacher shall not deliberately suppress or distort subject matter.” Ya, hej sure fella, you bet ya... The problem is, none of those states enforce their own laws. I don't know if Tennessee here has a law that requires textbook accuracy. They ought to, if they don't have one. If you don't have one, pass one. This is a textbook from about 100 years ago. It says: “God created the heavens and the earth in six days.”; “Prayer is a duty, but it is vain to pray without a sincere desire of heart ...”; “God governs the world with infinite wisdom ...”. Do you believe that's a public school textbook? Well, here is one today. 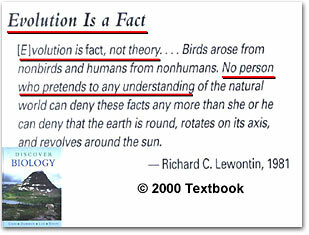 “Evolution is fact, not theory.” They say: “Birds arose from non-birds, and humans from non-humans. No person who pretends to any understanding of the natural world can deny these facts.” Wow, something has changed! Acktually, I was in Chickasha, Oklahoma, a couple of weeks ago. It was supposed to be a debate, but none of the professors would debate me. So they scheduled an evolution seminar two days after I was gone. They let me come and speak on creation, the student group got me in there. Here is a poster they put up right next to my poster. 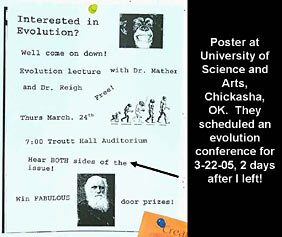 The poster was inviting people to come to the evolution seminar. “Interested in Evolution? Well come on down! Evolution lectures with Dr. Mather and Dr. Reigh.” It says: “Hear BOTH sides of the issue.” Well, we invited them to debate. They could have heard both sides all together. Here the kids get nine months of evolution teaching, I come in for two hours, and they panic. And then they got to say: “Hear both sides...”? Both sides? They're not going to present both sides. They are gonna present one side, the evolution side; which is what they already got for nine months. They don't wanna hear it. I think they said twenty people turned up. But fifteen of them were from the Baptist Student Union, just to see what those teachers would say, ok. They hear both sides! 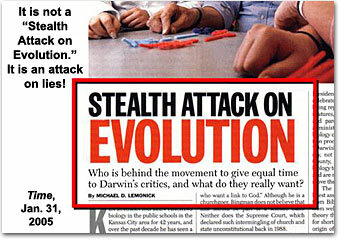 Their own textbook; there in Chickasha, Oklahoma; has ¼ of the book, one entire unit, devoted to the evolution theory. Nothing about creation. Evolution is a dying religion surviving only on tax dollars. It's dead. This textbook has over 100 pages where evolution is talked about. There is not one single mention of creation. So don't tell me they wanna hear ‘both sides’. They don't, ok. They wanna present one view only. It is called ‘indoctrination’, not education. It has always amazed me how two people can look at the same thing and come to opposite conclusions of what they are looking at. You know, two people can look at Grand Canyon. One of them believes in evolution. He looks at the canyon and says: “Wow, look what the Colorado River did ...for millions and millions of years.” The Bible believing Christian stands there and looks at the same canyon and says: “Wow, look at what the Flood did in about 30 minutes.” Now, how was that canyon formed? 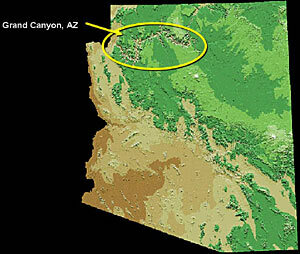 Textbook says: “Over millions of years the Colorado River carved the Grand Canyon from solid rock.” Oh, now hold on a second, ok. 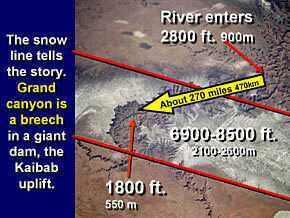 It is a fact that the Grand Canyon exists. I have been there a bunch of times. I taught earth science for 15 years. 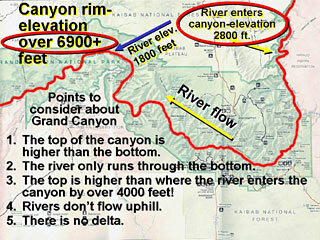 I love studying Grand Canyon. There are two interpretations of how it got there. The evolutionists will say: “It formed slowly with a little bit of water and lots of time.” Like, you know, billions of years. The creationists will say: “No, it formed quickly by lots of water and a little bit of time.” Like a big Flood in the days of Noah. And the guys who believe in evolution are always trying to erase the line. The line between their interpretation and try to include it as if it is part of the fact. No, no, it is just your interpretation guys, ok. This textbook says: “The Colorado River has cut through layer upon layer of rock over millions of years...” Well now, hold on a minute. This textbook says: “The Colorado River cut through 2,000 meters of rock, exposing sediment layers like huge pages in the book of life. Scan the canyon wall from rim to floor and you look back through hundreds of millions of years.” I don't think so. I was in a debate one time and this atheist said: “Hovind, you're so stupid. 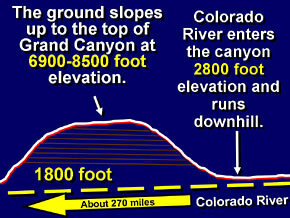 Don't you know it took millions of years to carve the Grand Canyon?” I said: “Well sir, there's a couple of things you ought to learn about the Grand Canyon.” If you built a dam across Grand Canyon a huge lake would fill in behind it. Covering several states, ok. I mean, it would take a lot of dirt to build the dam. But if you could build a dam across that canyon you'd have a really big lake. Actually some of the water from Wyoming drains through the Grand Canyon. It has a huge drainage pattern. Here is a picture of it, satellite false color image. You can see Grand Canyon right there. A big gash, right across a ridge in the mountains. You folks in Tennessee know where the ridge is. Not really a mountain, just a big long ridge, ok. If you look at Grand Canyon, it is pretty obvious that it is a washed out spillway, ok. Almost all rivers around the world come together at what is called acute angles, less than 90°. I mean, the rivers merge and keep going the same, you know, general direction. 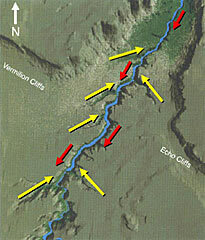 If you look at the Grand Canyon, the rivers on the lower left are indeed merging at acute angles, less than 90°. But, if you look at the upper right, the rivers are flowing backwards. Why would they do that? The rivers run backwards, hit the main channel, turn around and come back the other way. 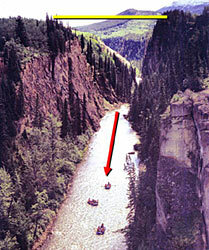 It is called a barbed canyon. There aren't many places like this on the planet. Well, this is evidence that a lake is draining. And as the water was running of the spillway backwards into the channel, it turns around, off the dam. Water runs off the dam to the low place, turns around, comes back out through the crack, to the breach in the dam. 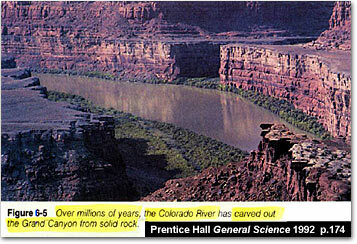 Grand Canyon was not made by the Colorado River over millions of years. That is one of the lies you kids are gonna face in your textbooks. It is just not geophysically possible for that to happen. Now, are there any farmers or vets in the crowd that might know what this machine is? What is that brother? That's a calf puller. That's a what...? A calfpuller! Once in a while a cow has a hard time having that baby calf and so they get the calf puller out. 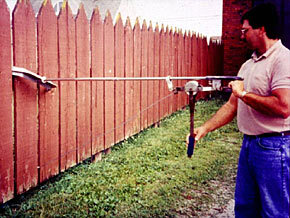 Tie the cable around the calf's legs and krr..krr... krr..krr..., jack the calf out of the cow. You got a few tons of pressure there, calf comes right out, no problem. Well, one day this farmer was out pulling a calf. It was a breeched birth, the back feet were coming out first. That is not good, but, you know, happens once in a while. 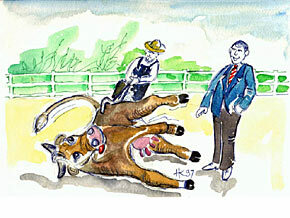 So the farmer had the calf puller out there, he is krr..krr... krr..krr..., trying to pull the calf out of the cow. And a city fella stopped his car to see what on earth is going on. And the farmer said: “Have you seen anything like this before?” The city fella said: “I have never seen anything like this.” The farmer said: “Do you have any questions?” The city fella said: “Yes sir, I have one question that has been bogging me for 10 minutes.” The farmer said: “Well, what's your question?” And the city fella said: “How fast do you figure that calf was going when it ran into that cow?” No, no, no, no, no! We are not separating a wreck here, fellas. You know, it is possible for two people to be looking at the same thing and one of them is getting the wrong idea at what he is looking at. The Bible says: “...they did not like to retain God in their knowledge.” (Rom. 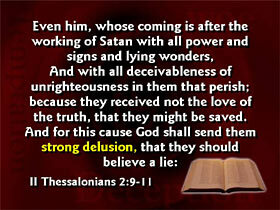 1:28) “...for this cause God shall send them strong delusion...” (II Thess. 2:11) Anybody that believes they evolved from a rock 4.6 billion years ago, I would say, is strongly deluded. You would have to have help to be that dumb, you could not do it on your own. You have to have years of training and conditioning to believe such a silly idea. Hey, is it possible for a person to go insane? I mean, absolutely loony? Oh yeah, that happens, doesn't it?, ok. Is it possible for an entire group of people to go insane? Can you imagine over 900 people drinking poisoned cool-aid and killing themselves? A whole group went insane. Is it possible for an entire nation to go insane? You know, like millions and millions of people go just plain ol' nuts? Oh, it has happened, folks. Hey, is it possible for the entire world to go insane? 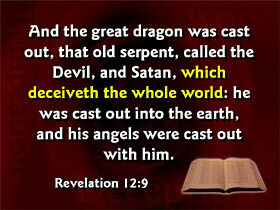 Well, the Bible says: “...the great dragon was cast out, that old serpent, called the Devil, and Satan, which deceiveth the whole world.” (Rev. 12:9) I think we are living in a time when just about the whole world has gone nuts. 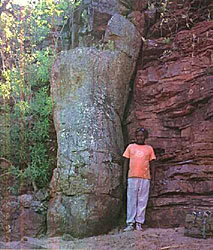 They believe they come from a rock 4.6 billion years ago. How dumb can you get? II Peter (3:4) goes on to say: “Where is the promise of his coming?,” that's what the scoffers gonna say, “For since the fathers fell asleep, all things continue as they were from the beginning of the creation.” That is an important phrase. The scoffers are gonna say the way things are happening now is the way they've always been happening. Long, slow, gradual processes. The Bible says, the scoffers are “ willingly ignorant.” (II Pet. 3:5) Willingly ignorant, in the Greek that means, dumb on purpose. They are willingly ignorant of how God made the heavens and the earth, and they're ignorant of the Flood. The world was “overflowed with water and perished.”(II Pet. 3:6) We cover more on that on videotape #2 in our series. 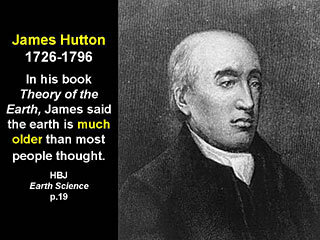 One of the scoffers in the last days was a guy named James Hutton. Now James Hutton lived in the late 1700's. James wrote a book that said: “The earth is millions of years old.” Now, you need to understand that in the late 1700's most Western people believed the Bible. Or at least they were strongly influenced by Christianity. And everybody thought the earth was about 6,000 years old. That was the common teaching of the day, ok. They taught the kids in the public school, you know, God created the world in six days. Like we saw earlier. 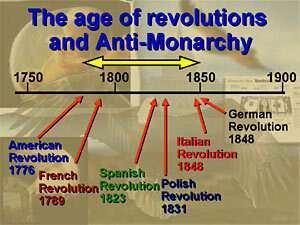 But this was also a time of many revolutions. We had the American Revolution; the French Revolution; the Polish, the Spanish, the German... Every country is just about revolting against the idea of a king, and establishing a democracy. So they threw off monarchies. And this is known as the age of Anti-Monarchy. So the Bible says to “Honour the king.” (I Pet. 2:17) And some people thought the Bible was an obstacle to their political objectives. And they wanted to discredit the Bible. Keep in mind this all happened early 1800's and late 1700's. So, back when everybody thought that the earth was a few thousand years old, James Hutton came along and said: “Oh no, it is lots older than that, and it got here by ‘uniformitarianism’.” Oh kids, big word, bold print, that'll be on the test, they always are, ok. Uniformitarianism means, the present is the key to the past. No, James, I think that the Bible is the only perfect key to the past. But during this time frame Christians instead of fighting against this new teaching of ‘millions of years’, they swallowed it. The Christians accepted the idea of a Gap theory, or Day-age theory, or Progressive creation. They just accepted ‘millions of years’ right into the Bible. When it is obvious to anybody with half a brain and one eye reading the Bible that it does not teach the earth is millions of years old. That's not what it says. So, the Christians did not put up an effective defense, effective resistence to this teaching. And they allowed the church to believe all this. 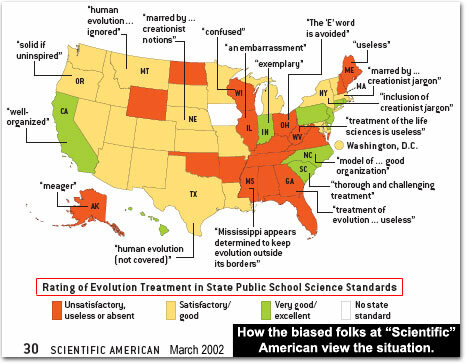 And then when evolution came out; 1859 became popular with Darwin's book; well the Christians just accepted that too! Boy, what a tragedy. 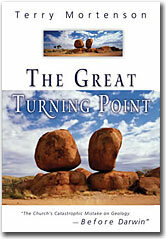 That book covers The Great Turning Point in history, if you got like the history of stuff. 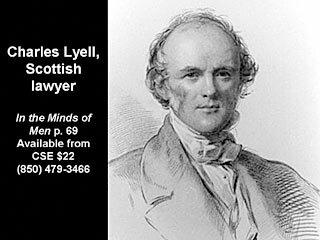 Well, James Hutton's book had a real strong influence on a young lawyer from Scotland, named Charles Lyell. 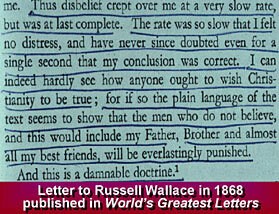 Charles Lyell, the lawyer, hated the Bible. Somebody calculated one time that if all the lawyers in the world were laid end to end around the equator, we would all be better off! 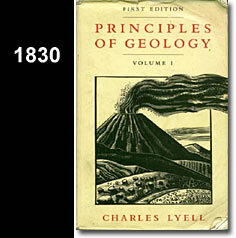 Charles Lyell, in 1830, wrote this book right here, Principles of Geology. I've got it here on the table. You can come and take a look at it, it is all marked up. In this book you can see his hatred for the Bible, kinda ooze off every page. He kept calling it “ancient doctrines,” he said: “Oh, you have scriptural authority,” he was mocking them, ok. He called it “religious prejudice”. He said: “Men of superior talent,” he is talking about himself, “...who thought for themselves, and were not blinded by authority.” He used every opportunity he could find to mock the Scriptures. And kids, you won't have to go to college very far before you're gonna run into a professor that has this mocking attitude toward God's word. How many of you had one when you went through school? It seems like their whole goal in life is to destroy your faith. I had a bunch of them when I went to school. They just wanna destroy your confidence. Well, Charles said his goal was to “free the science from Moses.” What do you suppose he meant by that? 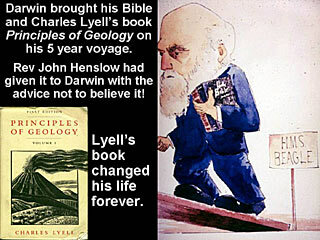 Well, before Charles Lyell wrote his book everyone looked at the geology, looked at the Grand Canyon and said: “Wow, look what the Flood did!” He didn't like people interpreting earth's history in light of the Bible. He wanted them to interpret earth's history in terms of millions of years. 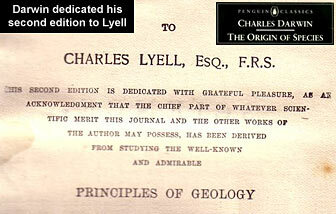 Lyell was the primary guy responsible for inventing what today is known as the ‘geologic column’. 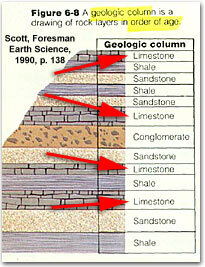 How many of you have ever heard of the geologic column before? They divided the earth up into layers and gave them names, you know. Cenozoic, Mesozoic, Paleozoic, Archeozoic, all that kind of stuff. Maybe you saw the movie Jurassic Park, named after the Jurassic layer, ok. Each layer of rock was given a name, and an age, and an index fossil. Now keep in mind all this was done in 1830 before there ever was Carbon dating; Potassium-Argon dating; Rubidium-Strontium dating; Lead 208; Lead 206; Uranium-235; Uranium-238; none of those had even been thought of. So they didn't determine these great ages by any radiometric decay method. They just picked the numbers out of the clear blue sky. It is a fact the earth has many layers of sedimentary rock. That is just a fact. You can see them all over Tennessee here. How did they get there? Well, there are two interpretations. And again, they are always trying to erase that line between the two and make their interpretation become part of the facts, and it's just not, ok. It is just their interpretation, that's all. 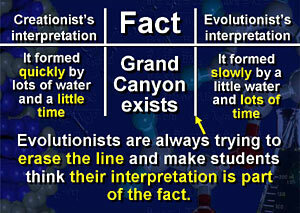 The geologic column is actually the Bible for the evolutionist. The only place you will ever find it is in the textbooks. It doesn't exist. This guy admits it, he said: “If there were a column of sediments... 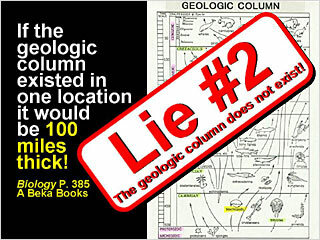 Unfortunately no such column exists.” Did you know that there is no ‘geologic column’? If there was it'll be 100 miles (160 km) thick! It doesn't not exist. It is one of the lies in the textbooks. 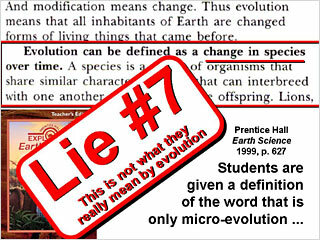 Actually, all of evolution is based on this lie right here. This is one of the most serious ones, in my opinion. It's true the earth has layers. That's not the question, ok. How did they get there though? I mean, if that layer sat there for 10 million years, waiting for the next one, don't you think it is gonna rain once in a while? In 10 million years? Why are there no erosion marks between the layers? Why are they stacked on top of each other, just like a stack of pancakes? 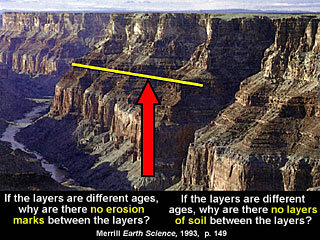 And by the way, why are there no soil layers between the rock layers? I mean, soil builds up on top of rock. Won't you think there'd be some soil build up once in a while? 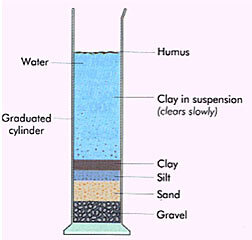 Look, if you get a jar with dirt, rocks, gravel, sand and mud and shake it up, and set it down, it settles into layers for you in a few minutes. It doesn't take long. How many have seen those things you buy at the mall with two pieces of glass, and different colours sand in between? And you flip it over and it makes all kinds of layers, just in a few seconds. It doesn't take long. That fella drove 50 miles one way that night to come hear me speak in Union Center, South Dakota. The crowd swelled to thirty-nine! We set up a chair in the aisle. Afterwards he talked to me for an hour. 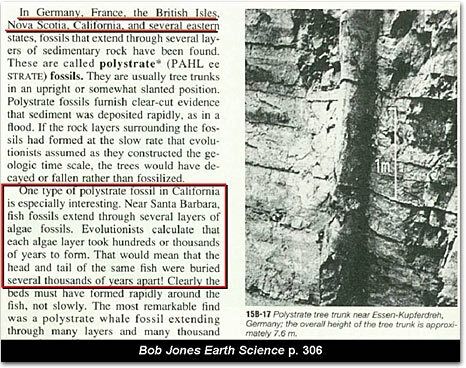 He said: “Hovind, is everything I believe about geology wrong? I teach this stuff at the college.” I said: “No-no-no-no, I like geology. I have a huge fossil collection, rock collection, mineral collection.” I teach earth science, I love studying geology.” I said: “But as far as the layers being different ages,” I said, “Yes sir, I'm sorry, that is all baloney.” It is based on circular reasoning. I'll show you. 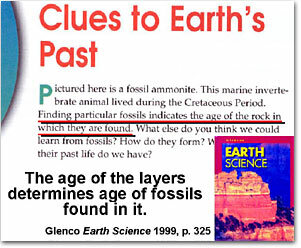 Here is a textbook that tells kids to “Date the rocks by the fossils.” And on the very next page it says to “Date the fossils by the rocks.” On the next page, and they don't catch it! 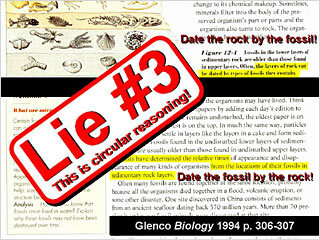 It's a lie; circular reasoning. 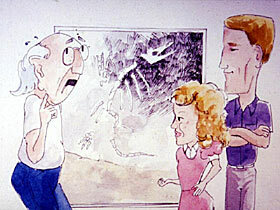 “It cannot be denied from a strictly philosophical standpoint geologists are here arguing in a circle. ...the relative ages of the rocks are determined by the organisms they contain.” They date the rocks by the fossils, and the fossils by the rocks. “There is no way to simply look at a fossil and say how old it is unless you know the age of the rocks it comes from.” This is Niles Eldredge, one of the most famous evolutionists alive today. He said: “And this poses something of a problem:” Something? It poses a big problem, Niles! 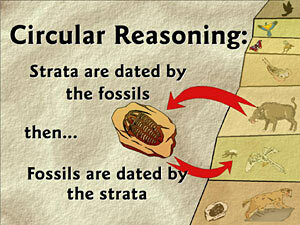 “...if we date the rocks by the fossils, how can we then turn around and talk about patterns of evolutionary change through time in the fossil record?” Circular reasoning. This guy said: “The rocks do date the fossils, but the fossils date the rocks more accurately.” I think the cheese he's done fell out of his sandwich, that's what I think, ok. He's a few fries short of half a meal. It's based on circular reasoning, ok. This guy said: “The charge of circular reasoning can be handled several ways. It can be ignored, as not the proper concern of the public. It can be denied, by calling down the Law of Evolution. It can be admitted, as a common practice... Or avoided, by pragmatic reasoning.” But it is all based on circular reasoning. Actually, at the Scopes Monkey Trial in 1925 over here in Dayton, Tennessee. How far is Dayton from here, steve? 100 miles, ok. This is what they were going to use as evidence for evolution. “The lowest layers are obviously the oldest.” Page 275 of the court transcript. No, the lowest layers are not obviously the oldest. Did you know in still water sediment layers settle out bottom first, and then the second one, then the third one, that's correct ok. But in moving water, you can get 5, 6 or 10 layers form simultaneously. They form from one end and travel across. 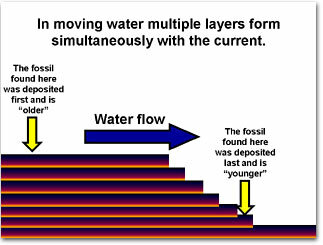 So it's possible to have a fossil on the bottom that is younger than a fossil on top, if it's moving water. There is a great videotape called, Experiments in Stratification, it covers all that if you want more on that. Or get our video #6, we're getting more of that later. I like to ask evolutionists, I said: “Guys, your geologic column contains limestone in quite a few places. If I handed you a piece of limestone how would you know if it is 100 million years old Jurassic limestone or 600 million years old Cambrian limestone? I mean, exactly what is the difference?” They'd say: “Well, the only way to tell the difference is by the index fossils.” That is precisely my point. They date the layers by the fossils. Trilobites as evidence that rock layers are 500/600 million years old or are trilobites alive today? This textbook shows the kids a trilobite. And it says, boys and girls: “Trilobites make good index fossils. 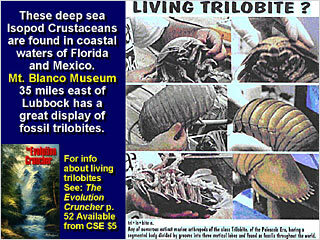 If a trilobite is found in a rock layer, the rock layer probably formed 500 to 600 million years ago.” I don't think so. 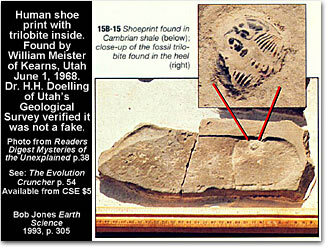 Somebody found a human shoeprint, where the guy with the shoe on had stepped on and smashed a trilobite. They asked evolutionists all over: “How on earth could a human step on a trilobite?” If trilobites lived 500 million years ago and man didn't get here till, you know, 3 million years ago, and they didn't start wearing shoes till 10,000 years ago. How could a human step on a trilobite? 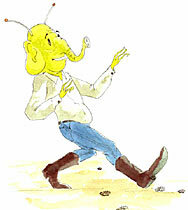 One atheist said: “Well, it is obviously, the only answer would be that aliens visited the planet 500 million years ago. Oh, them aliens will do it every time. Another guy said: “Well, maybe there was a large trilobite, shaped like a shoe, that fell on a small one.” Now, there are some big trilobites, ok. But I don't think they are shaped like a shoe. 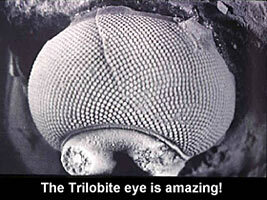 Actually, the trilobite has the most complicated eyeball ever! Trilobite eyes are unbelievable. And this is one of the first creatures to evolve? And it already has the most complex eye?! Just the eye is one of the most complex features you could have. No, trilobites are not ‘index fossils’ for anything, ok. There are all kinds of different types of trilobites, and there are probably are some still alive today. Certainly the Baltic isopod is still alive. A guy sent me, a couple months ago I guess, a whole jar full of trilobites from the Prudhoe Bay water treatment plant up there for the oil refining rig they got. When they arrived in Pensacola, Florida they were still alive in the jar! But I don't know how to keep a trilobite alive. I mean, what do you give them, mouth to what, you know, some resuscitation, but...? They all died. We got them in our museum there. Somebody just sent me a large one that they got down in the Caribbean. About this big [15'] (40 cm). It is in our museum and it was frozen. He said: “Yeah, I pulled it off a rock myself, down in the Caribbean, still alive. They call it for some kind of roach.” Roach? It looks like a big trilobite! Graptolite: This textbook shows the kids a graptolite. 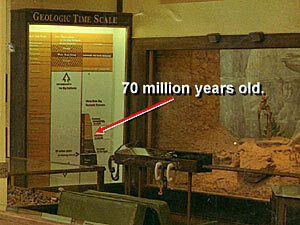 It says, boys and girls: “This is 410 million years old.” I don't think so. Graptolites were found still alive in the South Pacific 10 years ago. So if you find graptolite, you can't use that as an ‘index fossil’ for any age rock, ok.
Lobe-finned fish: They tell the kids in school the lobe-finned fish is the index fossil for Devonian. 355 million years old. See that short leg, boys and girls? He's got a little bitty leg and then the fin. Ah, see, that proves he's evolving from a leg to a fin. No, that's a lie. 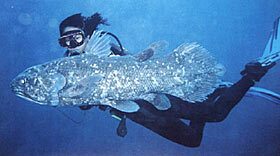 The lobe-finned fish, are still alive today, they're swimming around the Indian Ocean. And when they caught the first one 1938 the scientists looked at it and said: “Wow, would you look at that, they survived for 355 million years.” It never dawned on them once to question the geologic column. That thought never crossed their brains. 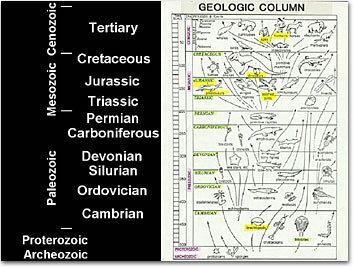 You don't question the geologic column, it is holy and sacred. 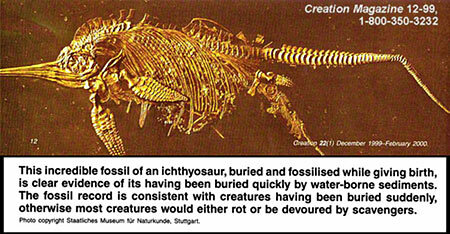 You just have to say: “It survived for 355 million years.” It is in the textbooks today. 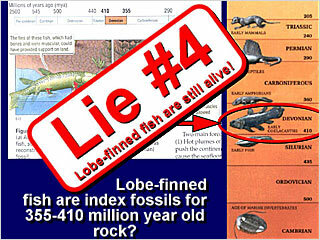 And they still say that it is the index fossil for 355 year old rock, even though they know they are swimming around in the ocean. How can they be that dumb? This lady wrote a book about it, A Fish Caught in Time. Yes, boys and girls, this is “our own great-uncle forty million times removed.” She does look a little fishy, you know, kinda around her gills there. You are gonna be told that dinosaurs are index fossils for the Jurassic period, 70 million, or Cretaceous, 70 million years ago. That's baloney! 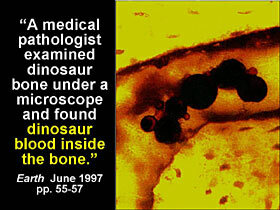 Dinosaur bones were found here recently that had blood cells still in them. How long are the blood cells gonna last? 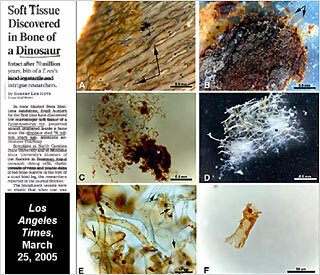 Here is soft tissue found with dinosaur bones, still flexible soft tissue. In March of 2005. 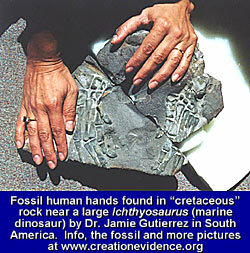 Here's fossilized human hands found in the same rock strata as dinosaur bones. Now, they tell you the layers are different ages, that is simply baloney, ok.
Now, Charlie Darwin didn't like round numbers. So he said: “The Wealden deposits are 306,662,400 years old.” How could he possibly known such a thing? All over the world petrified trees are found standing up, connecting these different rock layers. Petrified trees standing up, now how long does a dead tree stand up around here before it falls down? 5 years, maybe 10 years, ... 5 million? Oh no, not 5 million, that's for sure, alright. 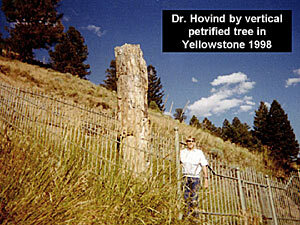 But yet, petrified trees in the vertical position are found all over the planet. I'll just flash through some pictures real quick here. There are all kinds of petrified trees found standing up. And they are running through multiple layers. And the kids are being taught the layers are different ages. And yet here's one tree connecting them all. I am having a hard time believing these layers are different ages, that's what I'm having. 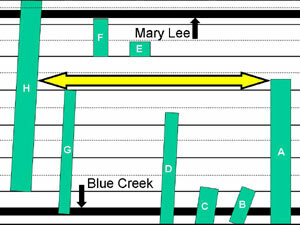 Central Alabama has got a large coal mine with a whole bunch of petrified trees standing up running through two seams of coal, the Blue Creek and the Mary Lee. Now they're gonna tell you in school, for coal to form, a forest has to grow and then it all falls over and turns into a swamp and then it gets buried. And then new mud washes in on top and the coal slowly forms from the forest that was buried. 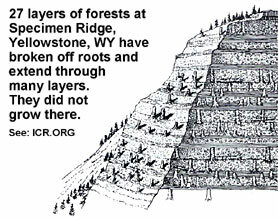 And then thousands of years later another forest grows on top. And a whole new layer of coal forms. So if you find two layers of coal, “Oh, that took thousands of years,” that's what they'll tell you in school. That is simply baloney. We cover more on coal formation on video #6. But, if you look at the samples of trees found in this coal mine, you look at sample A, B, C, D, E, F, G; I mean, every freshman lawstudent could tell ya: “Hey folks, I think I can prove these two coal formations formed at the same time, very quickly,” within a few weeks or months of each other, that's for sure. Probably during the Flood in the days of Noah. We cover more on that on video #6. In Cookville, Tennessee, how far is Cookville from here?...A 100 miles? ...150 miles. In Cookville, Tennessee there is a coal mine with petrified trees standing, running..., it is coalified at the bottom, petrified in the middle, and coalified on top! Where it went through a second coal seam. Same tree. By the way, why are coal seams generally found on top of layers of rock or clay? Wouldn't that be a pretty poor place to grow a forest? It ought to be on top of soil, don't you think?, ya. Polystrate fossils are found all over the world. In Joggins, Nova Scotia, there are dozens of petrified trees standing up connecting different rock layers. Scientists just go up there and look at them just say: “Wow, that is curious.” No, it is more than curious. It is devastating to your teaching that the layers are different ages. There is a brochure you can get from our bookstore, it's $2, it has 30-some pictures, colored pictures of petrified trees in the vertical position. Occasionally, the petrified trees are found upside down running through many rock layers. Now we really got a problem. I have thought about this till my brain hurts. The evolutionists have two ways to solve this. There is a third way to look at it; maybe they were all buried in a big flood. 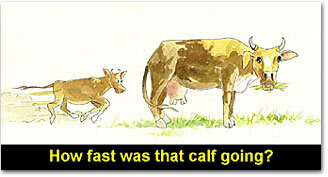 How fast was that calf going...? 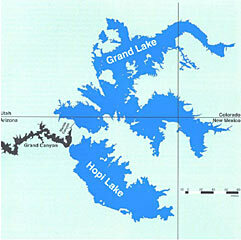 Keep that thought in mind, ok.
Mount St. Helens blew thousands of trees into Spirit Lake. Lots of those trees are now stuck in the mud at the bottom of Spirit Lake. They are gonna petrify in standing position. More on video #6 about that. It doesn't take long for things to petrify. 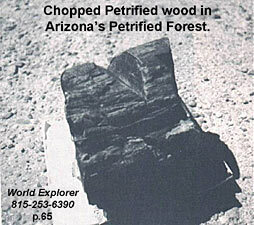 Here is petrified firewood. The guy chopped on it before it turned to stone. Here's a mummified dog that is stuck in a tree. Turned to stone, chased a raccoon up the tree apparently and got stuck. They named it ‘stucky’. What would you call them?, ok. 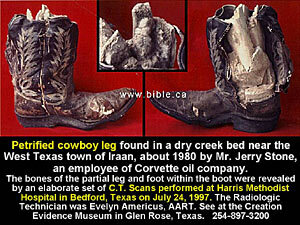 Here is a petrified cowboy boot with the cowboy's leg still in it. The boot was made 1950 and the leg has turned to stone. Here's petrified fish giving birth. It does not take millions of years to give birth. Praise God, ok. This is a petrified hat. Petrified pickle found in a jar. The guy sent me the jar and pickle. He said: “Brother Hovind, I found this in Montana in an old home, the house was ...a junk, the roof was gone, the house was falling apart.” But he said: “Do you wanna petrified pickle for your museum?” I said: “Of course, who in their right mind would not want a petrified pickle!,” you know. Come on down to Pensacola Dinosaur Adventure Land, and see the petrified pickle. Here is petrified sacks of flour found in a flour mill. It flooded in 1910, down in Eureka Springs, Arkansas. 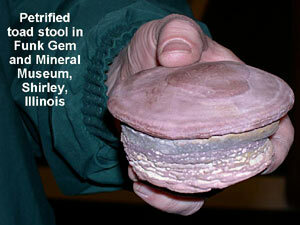 There is an amazing gem and mineral museum just south of Bloomington, Illinois. In a little bitty tiny town called Shirley Illinois, you got to be trying to find it to get there. But it's worth going to see the Funk Gem and Mineral Museum, ok. 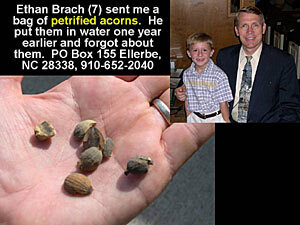 These are petrified acorns. This kind send them to me. He said: “Brother Hovind, I was seven years old at the time.” He said: “I stack these acorns in a bucket of water, and I though they might, you know, sprout and make some trees and..., I forgot about them. Next spring my mama found the bucket on the back of the porch and the acorns had turned to stone.” He said: “Would you like ’em for your museum?” I said: “Of course.” Come on down and see the petrified acorns. 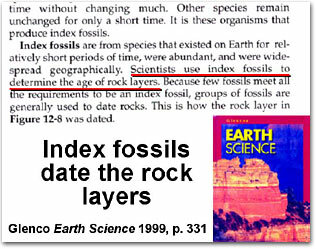 Even though this geologic column does not exist; except in the textbooks; that teaching is what changed people, in the 1830's, away from believing the Bible to believing in uniformitarianism. This teaching especially affected a young preacher. He just got out of Bible college, studied to be a pastor of a church. His name was Charles Darwin. Anybody ever heard of Charles Darwin? 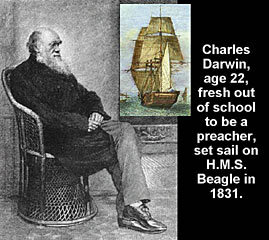 Charles Darwin graduated from Bible college to be a preacher. And he's gonna sail around the world for 5 years first and collect some bugs for some, you know, bugologists back there in England. Charlie brought some books with him. He brought his Bible, of course. He just got out of Bible college, and he brought this brand new book Principles of Geology. Charlie said, that book changed his life forever. He later wrote to a friend and said: “Disbelief crept over me slowly. I felt no distress.” He slowly lost his faith in the Bible. As Darwin sailed around the world, he stopped off at the Galapagos Islands. Here on those islands, he noticed there were 14 different varieties of finches. Little tiny birds with a little tiny beak, but the beak shapes were different. Now the Grant's went there and studied them and said: “Wow, during dry years the beak is a tenth of a millimeter thicker. And during wet years, it's a tenth of a millimeter thinner. But it always averages back out.” A tenth of a millimeter, do you know how much that is? Not much. Darwin looked at the birds and said: “You know what? I think all these birds had a common ancestor.” I bet you're right, Charles, it was a bird. And then Charlie said: “Well, maybe this proves that birds and bananas are related.” You say: “Oh, he never said that”. He sure did! I knew you wouldn't believe me so I brought his book. It's right here. The Origin of Species by Charles Darwin. On page 170, Darwin said: “It's a truly wonderful fact that all animals and all plants throughout all time and space should be related to each other.” Isn't he saying the birds and bananas are related? He sure is. This is a lie. See, this word ‘evolution’ has six meanings. We've been through this before, so I'm gonna go through it kind of quickly. There is first of all cosmic evolution, big bang. Secondly, chemical evolution where all the chemicals come from hydrogen. That's baloney. Thirdly, stellar evolution where all the stars formed from dust. You cannot get dust to condense into a solid star. It can't happen. There's Boyle's gas laws that drive it away, ok? Then, there's enough stars out there though, we can all have 11 trillion to ourselves. Then you have organic evolution where life gets started from non-living material. 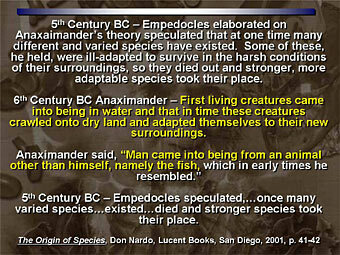 And then macro-evolution where an animal changes to a different kind of animal. None of those have ever been observed! Number 6, variations within the kinds, sometimes called micro-evolution. That one happens. The first 5 are religious. So whenever you discuss evolution, you have to define what you're talking about. If you're talking about #6, I'm with you. I agree that happens. If you're talking about the first 5, that doesn't happen. That is something you believe happens, ok. Watch how they change the definition for the kids. They say, ok boys and girls, “Evolution is change over time.” Oh, is that really what they mean? Watch this carefully now. “In other words, ...living things have changed over time.” Wait-wait-wait, are you gonna skip over the first 4? They just wanna bypass the first 4 stages like it's not part of the theory? Well then, you don't have a coherent theory. Then they say: “Evolution is defined as a change in species over time.” Now they're down to what I believe in. I think species can change. I think you can get some really weird varieties of animals, but they're still the same kind, ok. This is a lie, kids, that's not really what they mean by evolution. They wanna give you examples of #6 and make you believe that the whole theory has been proven. Don't get brainwashed. Most evolutionists will say: “Well, macro-evolution is just micro with longer periods of time.” No, it's not. They had a big conference on this very question in Chicago. They said: “The central question of the Chicago conference was whether the mechanisms underlying microevolution can be extrapolated to explain the phenomena of macroevolution. ... the answer can be given as a clear, No.” It doesn't work. Variations happen, sure, but they have limits. 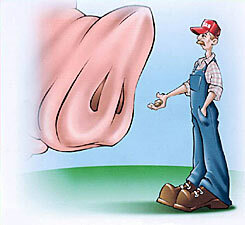 Did you know, farmers have been trying to get bigger pigs for a long time. You think they'll ever get a pig as big as Texas? 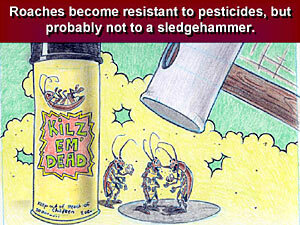 I bet there's a size limit in there, ok. Roaches become resistant to pesticides. Do you think they'll ever become resistant to a sledgehammer? Probably not, you see. There's a tiger that had 3 kittens, all different colors, same litter. That's variations, but it's still a tiger. That's not evolution. They always end up producing the same kind of offspring, just like the Bible says. The information for the new variety had to be in the gene code already or it couldn't produce it. No new information is ever added. The gene pool of the new variety is always more limited. Somebody spent years cross-breeding dogs to develop the Chihuahua. All of that money to make a dog that is 100% useless. I mean, think about it. 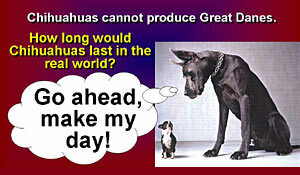 How long would the Chihuahuas last in the real world. Turn them all loose into the woods. Watch what happens. They run up to the wolf. Yap-yap-yap-yap-yap-yap. Crunch, end of gene code, right? Genetic information is lost, not added, when you get a strange variety. Real evolution would need an increase in genetic complexity. We don't ever observe that. I grew up in Illinois, corn country. Did you know there are so many kinds of corn up there, they have to number them? You'd be driving down the highway, and there's a sign that says BX65. Don't mix it with XL29, something will explode. Well, folks, you can cross-breed corn from now to the cows come home, and you always going to get corn. 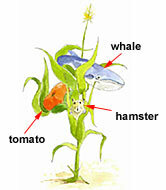 You're never gonna get a hamster, a tomato or a whale to grow on your cornstalk. It just ain't gonna happen, ok. 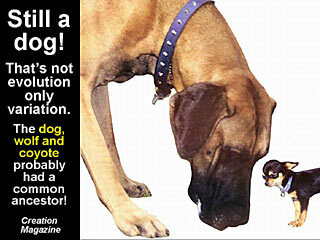 There is a whole variety of dogs in the world, and they might have had a common ancestor, a dog. Here's BBC News: “It looks like 95% of current dogs came from just 3 original founding females.” Hey, they're getting closer. Right here it says: “Today's dogs come in all shapes and sizes, but scientists believe they evolved from just a handful of wolves tamed by humans living in or near China less than 15,000 years ago.” They're getting closer. Man, if they keep studying their Bible, keep studying the science, they're gonna be an independent Baptist when they're done. You get done climbing the mountain of truth, that's where you end up, you know?, ok. 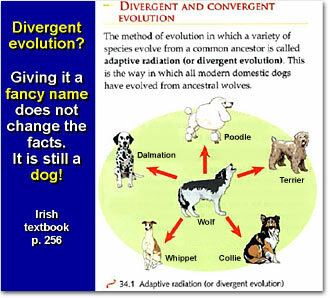 This Irish textbook calls it divergent evolution. Oh, come on. They show 5 dogs around a wolf. That's not divergent evolution. Don't give it a fancy name. It's still a dog. It's just a variety of dog. This Mexican textbook says: “The horse and the zebra had a common ancestor.” I agree. It looked like a horse. You know, four-wheel drive, genuine leather upholstery, all the standard horse equipment, ok. They've got little tiny horses today. 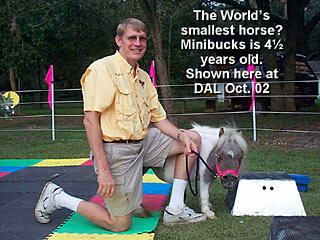 We had the world's smallest horse come visit our Dinosaur Adventure Land. Talk about useless. I mean, you know, you can't ride it. Well, my granddaughter could, but it won't bark, you know. What do you do with a horse like that? You know, horses, zebras and asses can all be crossbred. They have a competition in California, who can get the weirdest animal. 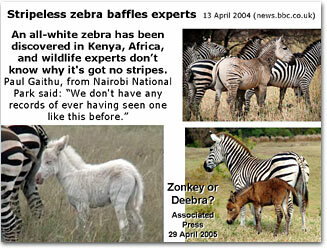 They'll get zorses, zonkeys, zeonies, z-donks, zebrass, and shebras. Here's a zebra who forgot to put his pj's on. 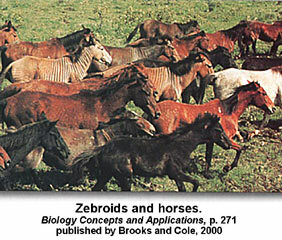 Here's a herd of zebroids running around. You know, in the last hundred years, the Kentucky Derby has gone from an average running speed of 127 seconds down to 123 seconds. Even in the old days, they had some pretty low times turned in, ok. 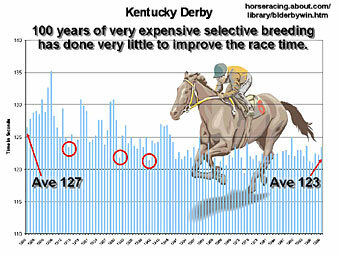 Question: “How much money would you guess has been spent on selective breeding trying to get the fastest horse for the Kentucky Derby?” Millions and millions of dollars. They do the same thing right around here, don't they? Spend lots of money for a Tennessee Walker. What's the most expensive Tennessee Walking Horse that you've ever heard of? A million dollars for one horse? Three million for one horse? That's how much per pound? Man, when I was in Italy, we ate horse over there. It was good too. It tasted like chicken, you know. I don't know if they've gotten to the absolute limits of horse speed or not. I don't know. But I suspect they're getting kind of close, ok? If you really want to win the Kentucky Derby, why don't you breed wings on your horse and fly around the track in 12 seconds? The whole point is, sure, you get varieties, but they're limited. There is bunch of different kinds of cows in the world, and they might have a common ancestor, a cow. There is magazines where you order chickens. All right, boys and girls, should we order, you know, Cinnamon Queens, Red Rocks, White Rocks, Cherry Eggers or Brown Leghorns? 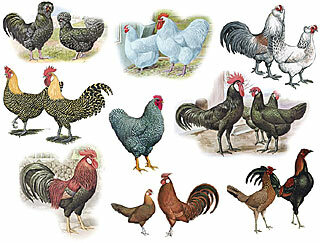 Well, look what the magazine says: “Jungle Fowl are the original bird from which all varieties and strains of domesticated chickens are derived.” Did you know all the chickens had a common ancestor? Anybody wanna guess what it was? Chicken. You got it. There are 8 kinds of bears in the world, and they might have had a common ancestor, a bear. You know, broccoli, cabbage, cauliflower, and Brussels sprouts all have a common ancestor, called a plant. 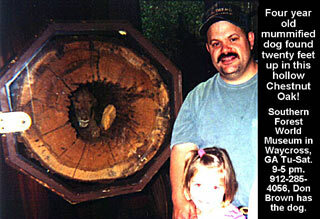 In California, they got huge fields where they graft English walnut trees onto black walnut stumps. 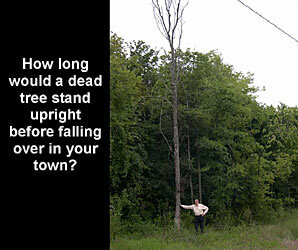 They do it because the black walnut stump, the root system is tough and can handle the weather over there. But the black walnut doesn't taste as good, it doesn't sell for as much money, and it's tougher to crack. English walnuts taste better. They sell for more money, and they're easier to crack, but the root system rots. So they cut them off and stick ’em together. They do it all, over there. Well, they can do it because they're both a walnut. 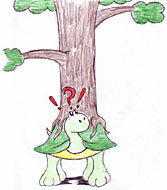 See, you could never graft an English walnut tree onto the back of a turtle. That won't work, see? The sugar beets were used for years when sugar got expensive. They wanted to get sugar out of beets. 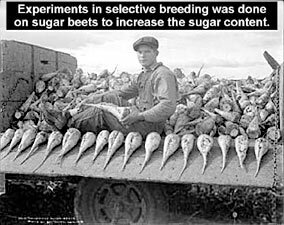 So they tried to do selective breeding to increase the sugar content in sugar beets. They raised it from 6% to 17%, but could not... they ran into a brick wall, they can't go past 17, and... the further they got away from the normal wild sugar beet, the more problems they started having. Now you got to babysit the field and spray pesticides and bugicides and everything else on it, ok, because its disease resistance goes down. People say: “Don't bacteria become resistant to drugs?” Well, that's because they lose information, not gain it. I'll show you. Dr. Spetner points out: “This is based on a misunderstanding. For the mutations that cause antibiotic resistance still involve information loss. For example, to destroy bacterium, the antibiotic streptomycin attaches to part of the bacterial cell called ribosomes. Mutations sometimes cause a structural deformity in ribosomes. Since the antibiotic cannot connect with the misshapen ribosome, the bacterium is resistant. Even though this mutation turns out to be beneficial, (for the moment) it still constitutes a loss of information, not a gain. No ‘evolution’ has taken place. The bacteria are not ‘stronger’. In fact, under normal conditions with no antibiotic present, they are weaker than their non-mutated cousins.” I'll give you an example. Suppose somebody's come into your town, and they're handcuffing everybody, taking them off to jail, and then, they're gonna kill them. But you don't have any arms. So they can't handcuff you. Ha, ha, ha. Is that a beneficial mutation to not have arms? Well, yeah, for the moment, ok? But in long-term, it's not beneficial, ok? And so all the examples they ever point to are bacteria becoming resistant to drugs. That's a loss of information, not a gain. The Bible is correct. They bring forth after their kind. James Hutton wrote a book in 1795, and people began to doubt the earth was 6,000 years old. 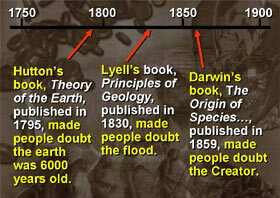 Charlie Lyell wrote a book in 1830, and people began to doubt the Flood. And Charlie Darwin's book made people doubt the Creator. And by the mid-1800's, people were wondering: “Wow, if God didn't do it, how did we get here? Who's in charge of the world?” That led directly to the rise of communism, Marxism, socialism, Nazism. 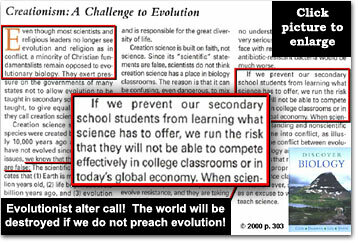 We'll cover that on seminar part 5, politically incorrect, The Dangers of this Evolution Theory. Professor Wilson at Harvard University said: “As were many persons from Alabama, I was a born-again Christian. When I was 15, I entered the Southern Baptist Church with great fervor and interest in the fundamentalist religion. I left at 17 when I got to the University of Alabama and heard about evolution theory.” He lost his faith, first year of college. That's what happened to Phillip Wentworth, studied for the ministry at Harvard, lost his faith, gave up on the ministry. This Marty wrote me and said: “I want to let you know, your ministry has been a blessing to me. I'm one of the high school students in the anthropology class that is a victim of the dangers of evolution teaching. I was very discouraged and questioned the existence of God. I listened to your seminars and that completely encouraged me and that was a blessing to me.” Yeah, rescued one. It's amazing how many thousands of people down through history have lost their faith because of this evolution teaching. 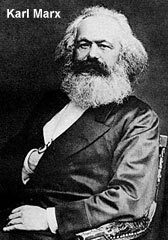 Karl Marx studied, said that he wanted to serve God with his life. He went off to college, became an evolutionist. Comrade Stalin, there was a Special this afternoon on TV. 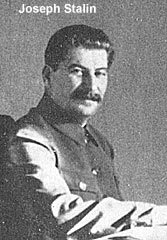 How many saw that about Comrade Stalin on the History Channel? He went to a Christian school, read Darwin's book, became an atheist, killed between 60 and 100 million of his own people. 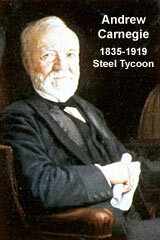 Andrew Carnegie became an evolutionist reading Darwin's book. He said, it freed him from the shackles of religion. “Light came in as a flood. And all was clear. Not only had I got rid of theology and the supernatural, but I found the truth of evolution.” Carnegie left behind millions of dollars to make sure evolution is taught in our schools instead of creation. He funded the National Center for Science Education. The list is really long. We'll have to quit now. But “75% of kids from Christian homes who go to public schools lose their faith after one year of college.” What's in these textbooks anyway? What are they teaching our kids that's making them lose their faith? Oh, we'll cover some more lies in the textbooks in the next session.